Here in the UK, It's a real effort to want to perform any form of exercise in the current climate. It's much easier to open windows, fashion a cooling breeze through the house, relax in front of the Ashes cricket on the TV, and watch the weekend melt away. The recent heat wave here in the UK, and the ensuing warnings about heat stroke on the hills, has got me to thinking about the weather I'll be expecting to encounter in Australia. The other week saw me sweltering on Dartmoor in a none too shabby 27 degrees Celsius. In that heat I am always reluctant to travel too far, and on that occasion I opted for a wild camp on Steeperton Tor. 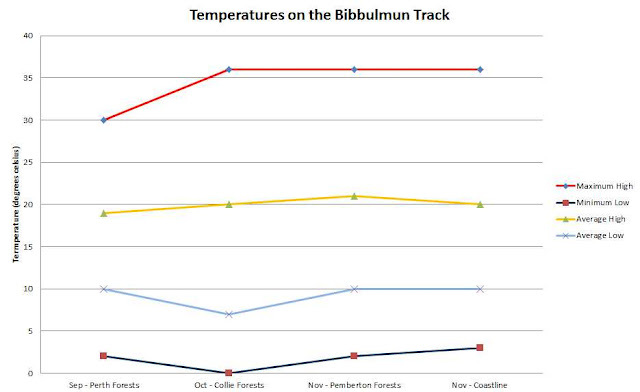 The average maximum temperature ranges from 19 to 21c, and the low is around 7 to 10c. That, for me, is comfortable, especially considering I hope to get as much mileage in before the afternoon heat sets in.